Presbyopia is the loss of flexibility of the lens inside the eye, occurring as a natural part of the aging process. In younger years, the lens changes our focus from distance to near and back by changing its shape. As the lens ages in presbyopia, it thickens, becoming less flexible and our ability to focus on near objects and to read small print deteriorates. The first signs of presbyopia are that people will find themselves holding items further away and struggling to read in dim light. 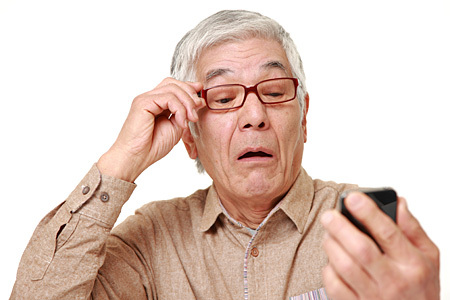 Other symptoms of presbyopia may include tired eyes, eye strain and headaches alongside focussing difficulties. Presbyopia typically starts in our forties but can happen earlier or later in some patients. Presbyopia is progressive so regular eye examinations are always recommended to maintain appropriate visual correction and good eye health. Presbyopia cannot be prevented or cured but fortunately we have several ways of maintaining comfortable clear near vision with a variety of glasses and contact lenses that can be tailored to help with your unique visual requirements. As well as single vision reading glasses focussed for close work or at the computer distance, there are several kinds of multifocal spectacle lenses designed to give clear vision at multiple distances for patients with presbyopia. These include distance to near (varifocal) progressive lenses which provide clear vision at distance, intermediate and near and occupational lenses for computer and reading. Our dispensing opticians can help you find the best lenses to suit your individual visual requirements and even tailor the lenses to minimise distortion based upon your specific posture and head and eye movements. The simplest way to correct presbyopia with contact lenses is to have one eye focussed for distance and the other eye for near, this method is called mono-vision and works very well for some patients. Multifocal and bifocal contact lenses simultaneously present the distance and near prescriptions to both eyes. These kind of contact lenses have undergone tremendous technological improvements over the past decade and there are now several multifocal daily disposable and monthly disposable soft contact lenses available in a variety of materials. Tailor made soft and rigid gas permeable contact lenses are also available in bifocal and multifocal designs as well as more advanced specialist options. The more rigid lens designs provide a new refractive surface to the eye which can provide excellent visual acuity at all distances to patients with high astigmatism and irregular corneas. By combining the latest multifocal contact lenses with mono-vision techniques we can provide good vision at all distances to presbyopic patients of any age, with any prescription. To ensure suitability and to find the most appropriate contact lenses for your eyes, book a consultation with a one of our contact lens specialists at our London practice.